I still had more buttermilk, so I decided to try a different recipe from food.com. I think these were an improvement over Alton’s. I still wish there was more rise – I long for the mile high biscuits that grace magazine covers. I also have decided that even though round biscuits are prettier, square biscuits are easier and there are no scraps to deal with. 1. Preheat your oven to 450°F. 2. Combine the dry ingredients in a bowl, or in the bowl of a food processor. 3. Cut the butter into chunks and cut into the flour until it resembles course meal. 4. If using a food processor, just pulse a few times until this consistency is achieved. 5. Add the buttermilk and mix JUST until combined. 6. If it appears on the dry side, add a bit more buttermilk. It should be very wet. 7. Turn the dough out onto a floured board. 8. Gently, gently PAT (do NOT roll with a rolling pin) the dough out until it's about 1/2" thick. Fold the dough about 5 times, gently press the dough down to a 1 inch thick. 9. Use a round cutter to cut into rounds. 10. You can gently knead the scraps together and make a few more, but they will not be anywhere near as good as the first ones. 11. Place the biscuits on a cookie sheet- if you like soft sides, put them touching each other. 12. 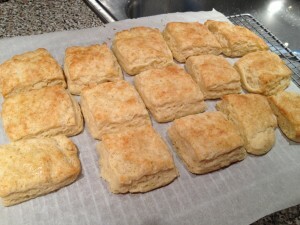 If you like"crusty" sides, put them about 1 inch apart- these will not rise as high as the biscuits put close together. 13. Bake for about 10-12 minutes- the biscuits will be a beautiful light golden brown on top and bottom. Do not overbake.